Have you ever wondered why doughnuts have a hole in the middle? A man named Captain Hanson Gregory from Camden, Maine, claims to have invented the modern day ring-shaped doughnut in 1847. There is even a plaque in Rockport commemorating his doughy creation. Whether you believe the story or not, doughnuts have a special place in many Mainer’s diet. Here are the 10 best doughnut shops in the state. Congdon’s started back in 1945 with Clint and Dot Congdon. 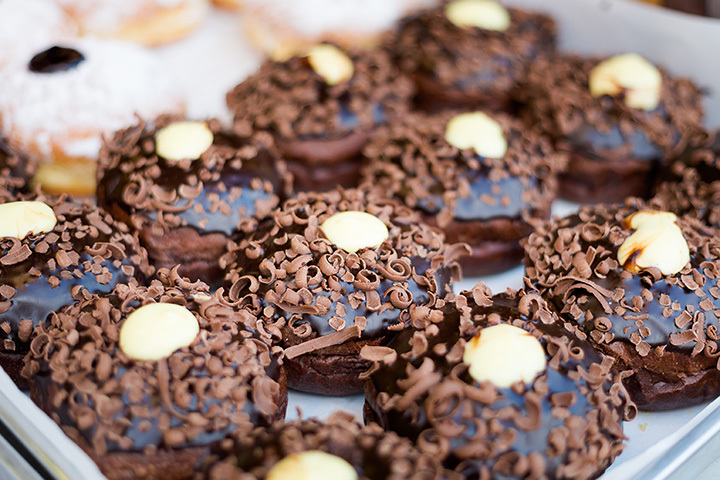 Congdon’s was voted one of “America’s Best Doughnuts” by Food & Wine in April 2012. With 32 different flavors, like buttercrunch, chocolate crunch, and sugar cruller, there is no question why Congdon’s continues to top the best doughnut lists. Former Congdon’s Doughnut maker, Kelsey Quint, opened her own doughnut shop in Sanford selling fresh handmade doughnuts daily. You’ll find a wide variety from raised doughnuts covered with glazes like chocolate or maple, and other traditional doughnut styles with toppings like butter crunch and chocolate. Whatever you choose, it will be quite the treat! Born in 2013, Little Bigs brings quality hand-held street food, like doughnuts, fruit pies, and meat pies, to Maine. No need for utensils here! In 2015, Little Bigs recreated Dominique Ansel’s “Cronut,” which put this tiny bakery on the map in Maine. If cronuts aren’t your thing, the Boston almond cream filled doughnut is quite good. Tony’s Donuts is a Portland landmark serving up its famous donuts for over 50 years. The dense yet delicious donuts are made by hand daily and sold out soon after. Popular donuts include honey dipped, molasses, sugar, chocolate, and good old plain. Potatoes are grown in abundance in northern Maine. What better way to see Maine ingredients than potato donuts! Don’t worry, they taste delicious. The Holy Donut regularly attracts national media attraction and often popular flavors sell out within hours. You’ll want to be at the front of the line when the doors open. If you want a unique Maine flavor, try the Allen’s Coffee Brandy. Started by Bob Frost in the 1950s, Frosty’s has grown into a doughnut empire since 2012 when the company expanded to Freeport, Bath, and Gardiner. You can also find the doughtnuts in select Hannaford stores, too. With tons of handcrafted flavors to choose from, you really can’t beat the Maple donut. Opened seasonal in Naples, Pretentious Pie Co. brings taste of VooDoo Donuts to Maine with crazy glazes and toppings like Oreo, Fruit Loops, and Snickers. The classic cinnamon sugar donut is always a good choice, especially after a day on the lake. Gosselins Bakery has been a family-run business since 1945 and still is a bit old school. They don’t use social media and only except cash. Don’t let their fear of technology scare you away from trying Grandpa Gosselin’s famous doughnut recipe. The shop closes when the doughnuts sell out so get there early. During the winter months, you’ll find this popular food truck parked at Sugarloaf and during the summer months in Portland. The doughnuts are mini so don’t feel bad when you order multiples. With flavors like candied bacon and Fruity Pebbles it’s hard not to! Located in “The County,” Sadie’s Bakery only offers two flavors of doughnuts a day. You’ll always have plain, but the second flavor changes between molasses glazed, pumpkin, or chocolate. The doughnuts go fast so get there before the hungry potato pickers do.